The first visit of 2007 was on Tuesday 3rd March. A group of seven members met up around the buffer stops area at Paddington. We caught the local service out to Greenford Station where Network Rail's Local Operating Manager, Matt Law met us. After a short walk along a road we crossed some running lines and went into the Greenford Signal Box. The Great Western Railway opened the box in 1904. It was extended in 1956 and now has a 76 lever frame. It is a manual track circuit box, connecting with Marylebone IECC at Northolt Junction and Slough IECC at Hanwell/West Ealing and Park Royal. A screen shows the state of the track circuits, where the progress of a moving train can be followed. The line from Northolt Junction was singled in 1991 when Marylebone IECC was opened. Both the Park Royal and Drayton Green (Hanwell/West Ealing) lines remain double track. Distant signals are colour lights but most home signals are semaphore. 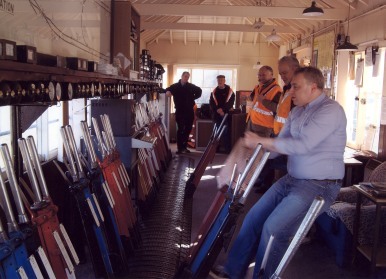 Four signallers operate the box, Keith Harris being on duty at the time of our visit. While we were there three trains passed through as well as the half hourly local service to and from Paddington. This terminates in the bay between the London Underground Central Line platforms, which are at a higher level than the other lines. A modernisation programme is currently underway, four semaphores are being replaced by three colour light signals. This has been prompted by the down junction signal on the line from Drayton Park falling down the embankment! Scaffolding is now holding it up. Much of the line from Drayton Green is on an embankment and has been the subject of numerous slips. Both platforms of South Greenford Station had to be rebuilt a few years ago. The new signals have been installed and were due to have been commissioned this spring but this has been delayed by a shortage of skilled engineers some of whom have been drafted away to other projects. First was a Class 165 DMU on the Chiltern Railways service from Paddington (11.11 to Princes Risborough). Next was the EWS empty freightliner flats for maintenance service, headed by 66 066 - 6V73 10.28 Northolt Junction - Old Oak Common (running about 60 minutes late). Finally there was a Freightliner service, the loaded 6M22 - 09.21 Cricklewood to Calvert rubbish train. This was headed by 66 515, coming down from Drayton Green we watched it come under the Central Line bridges, round the back of the box, before heading north. Along with the working floor of the box we were also shown the locking room underneath, both with explanations. The box still has a future, a current plan will see the resignalling of the Great Western Main Line controlled by a new box at Didcot. Reading will be first, with control of the Greenford area moving in about 10 years? After an interesting visit, it was time to leave. Our thanks go to Matt and Keith (Network Rail) and to Richard Kingston (L&CI) for organising it.